Wishing you a Fabulous and Creative 2016! 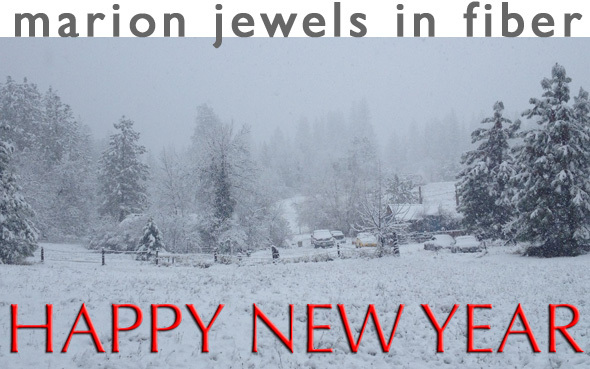 Thank you for your business, loyalty, and friendship in 2015. 1. Try a different App/Web browser such as Firefox or Chrome. 2. Paypal Invoice - Email your order, shipping address & billing address if different We will generate a Paypal invoice payable with any major credit cards. Medium Brown is in. Yey, it is the last color to complete the Tex 400 color offering. Aurum, Green Olive & Myrtle Green just arrived - Medium Brown the last color of this new set is a bit late, but expected soon. 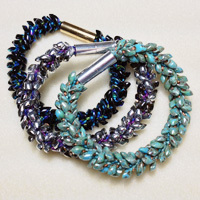 The Bracelet Duo was released at the Portland Show last week and was very well received. 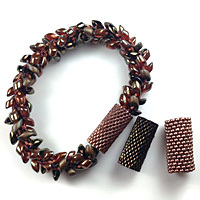 The Bracelet Duo Kit makes two bracelets with different bead placemenst. 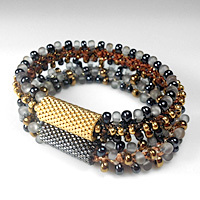 It makes an interesting duo and the two bracelets can be worn together. The Necklace Plus Kit is brand new. The kits still need to be packed, the instructions finished, but it will be ready within a few days. 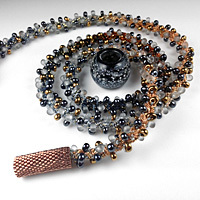 The kit makes 2 necklaces, or 1 long necklace and 1 bracelet. 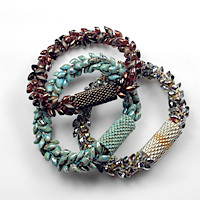 The bracelet can be stacked together with the Bracelet Duo for a trio. 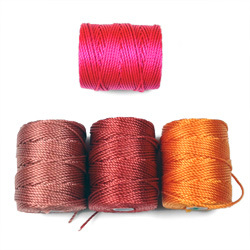 Copper Rose, Venetian Red, Popsicle Orange and Fluo Hot Pink are in. 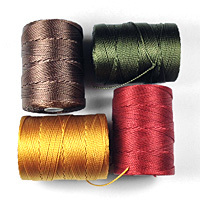 Aurum, Medium Brown, Green Olive & Myrtle Green are expected in September. August 18 - Back from Quilt!Knit!Stitch! The quilt exhibits were fabulous with many museum quality quilts on display. Thanks to everyone who came by. You made the show well worth attending. If you are getting an order sent by mail or a PDF by email, I will be working on them later today and tomorrow. 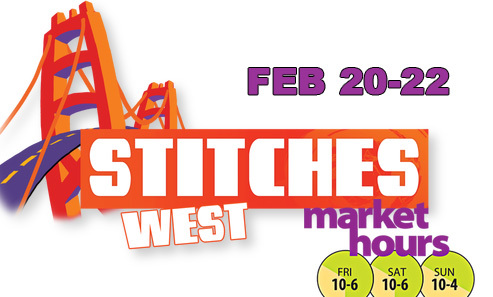 Please note that the show next year is moving to Houston. That's a bit far for me to drive... Let's hope they bring a show back to the West Coast in the future. 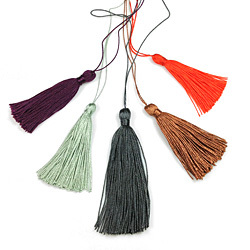 One of the latest trend in jewelry making is tassels. 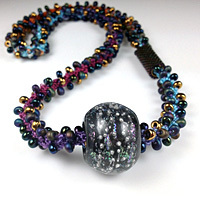 They are featured on malas, attached to bracelets, earrings and more... 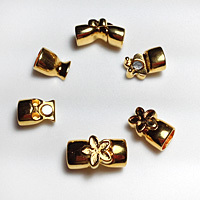 In fashion you can find them everywhere, on belts, shoes, purses along with fringes. 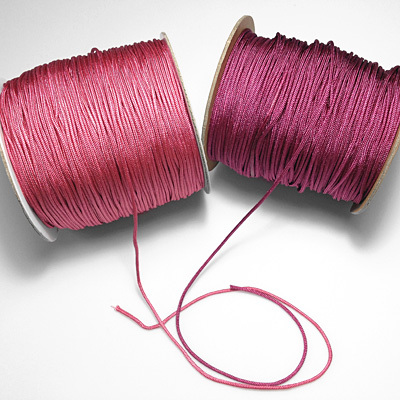 We changed the way we wound the cord from card to bobbins and it saved time, so we are passing the savings on. 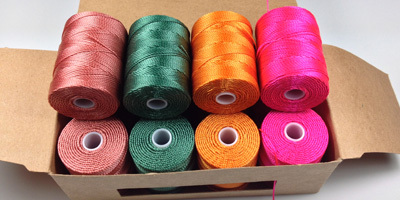 The cord comes in many colors and many sizes, but we only carry selected brands of Chinese Knotting Cord that have a proven quality record. A customer gave me a box a few years ago, so it has been in my tool drawer for a while, but I resisted trying and using this product, thinking beeswax was the best natural product... But after a long talk with a thread rep, I am giving it a try. We talked about the shelf life of bonded nylon and I found out that if it is stored properly - with no moisture and in a clean place, bonded nylon has an indefinite shelf life. 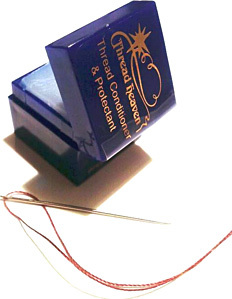 But the thread rep suggested that if the thread or cord gets a bit brittle, a thread conditioner, something like Thread Heaven, can restore it to its original condition and further protect it for the future. Plus, it is non toxic, acid-free and can be used in conbination with beeswax if desired, so yes, I will be using it in the future. Aurum, Medium Brown, Green Olive arrived July 1; Venetian Red came a bit later in on August 7. 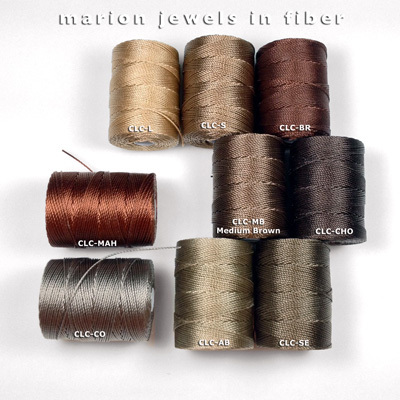 C-Lon just added 4 new colors, 4 more to arrive in July, then the same colors will be added in August & September in the heavier Tex 400 size. 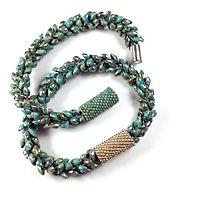 Why add a Peyote beaded sleeve over the magnetic clasp, besides esthetics > Read why this new feature came about! It's easy to learn especially with tutorials with large close up pictures. If you are new to Peyote, start with an even count peyote with Delicas Size 11. The Delicas are super even and easy to work with as they fit nicely together. 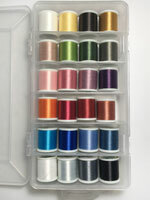 It is a very fine thread equivalent to C-Lon Bead Cord Size AA, but with the addition of the pre-waxed component. 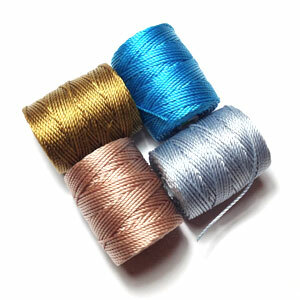 I like several of the colors, but as far as I am concerned C-Lon Bead Thread Size D and AA will work well too, as long as you add a bit of wax to the ends and a light coat across the full length, so they thread onto needles more easily. 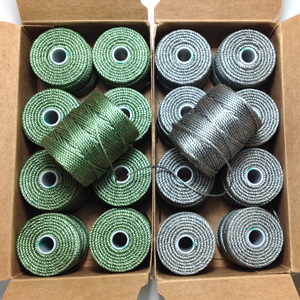 Beading thread according to breaking strengths: WildFire - 10 lb breaking strength, C-Lon Bead Thread Size D - 7 lb breaking strength, 6 lb FireLine, C-Lon Bead Thread Size AA or KO/Miyuki Beading Thread - 7 lb breaking strength. The very last spools of a rare find, Vintage Mastex Nylon #18 thread, circa 1990-2004, all on the tall black plastic spools arrived today. The last colors still available are Slate, Delft Blue, Rose, Maple & Cognac. Maple shown on the left is one of my favorite color. 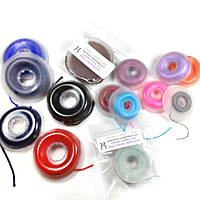 Vintage Tex 135 and Nylon 69 in 1 oz spools also arrived in this shipment. 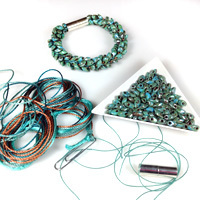 At shows, I braid sample pieces as examples and one finished bracelet in particular attracted so much attention that a new kit was born. 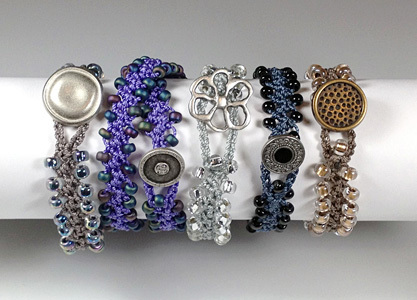 I spent some time making a bunch of bracelets until I was satisfied with the results. Along the way some technical problems were resolved. 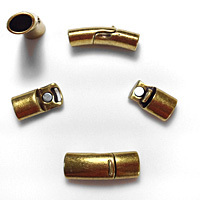 A center core was added so the length of the bracelet will remain the same over the lifetime of the bracelet. 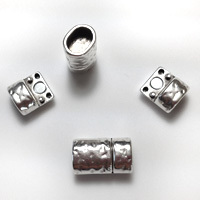 The C-Lon Tex 400 Bead Cord can be peaked at through the Long Magatamas. 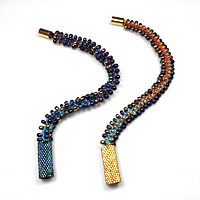 It gives a color background to the beads and it is a great way to show off all the new colors of Tex 400. 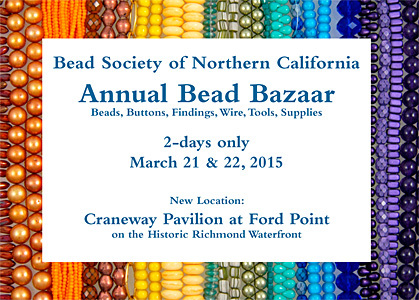 This show was moved to a new gorgeous location right on the bay with free parking. 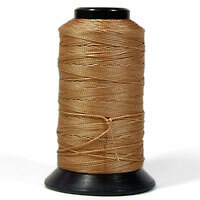 Boxes of Chinese Knotting Cord arrived last week from several sources. Days later after countless hours of work, all was catalogued and compared. 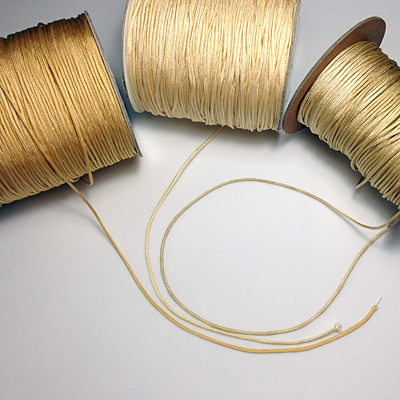 Cord quality and diameter was checked. New colors or dye lot variations were named or renamed. 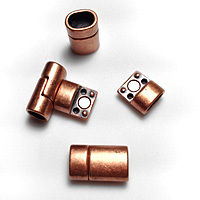 Jpegs were made or adjusted and the website got finally updated Saturday morning with all the new stock or replenished stock. 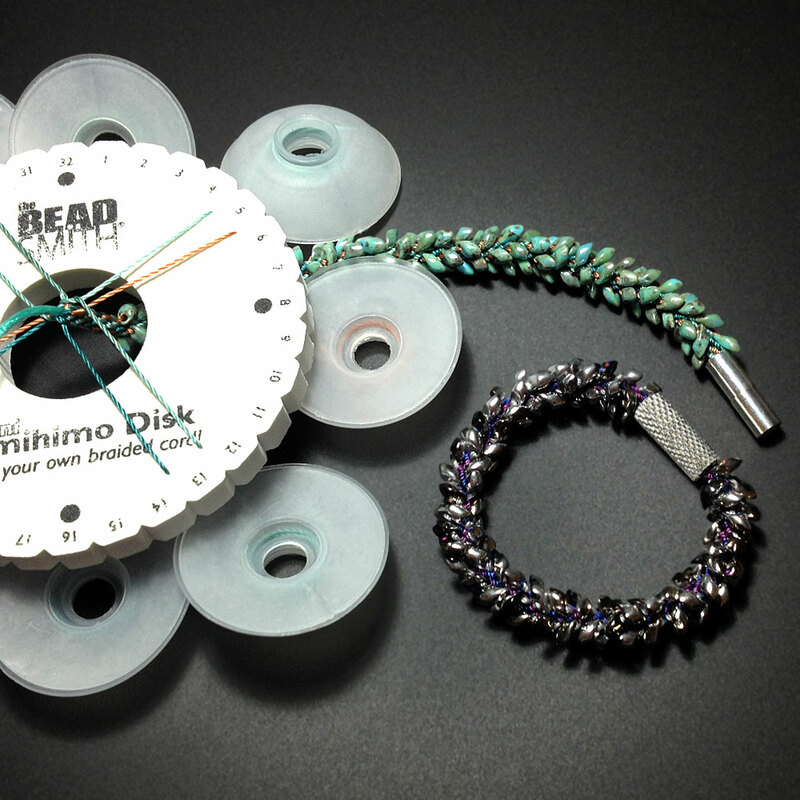 New colors just got added to the bead & button packages and bracelet kits. 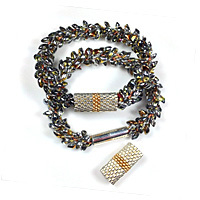 Rainbow Beads with a Silver Cushion Top Button crocheted with Cocoa C-Lon Bead Cord Tex 400, & Silver Lined Beads with a Silver Flower Button with Argentum C-Lon Bead Cord Tex 400. Just in: Golden Olive, Cyan, Pearl & Blush. Keep in mind that this schedule may not be exact. 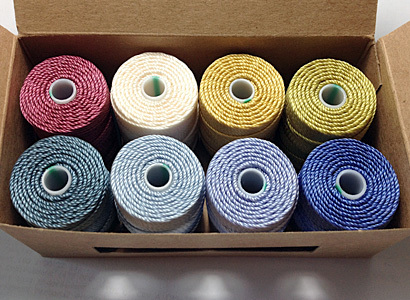 Wow, 100 colors, 8 more to arrive! I played musical chairs with the colors and come up with a new arrangement > see large pictures of all the spools. The last 2 colors of December just arrived - they are still in their boxes. 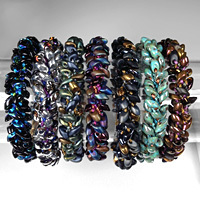 January: Blush, Cyan, Pearl & Golden Olive - these colors are in transit and should be here this coming Monday or Tuesday.